This post grew out of a comment I was moved to make when reading Michele’s @NewBizBlogger post Are You Creating An Inner Circle?. Michele offers online business tips of interest to anyone who reads this blog. We all need to be creating “inner circles” or Tribes or collaborations. No matter what you call them they are essential to our success. Collaborating is going to be THE most important factor in our success going forward. Only those businesses and bloggers who continually collaborate with others in their niche will have enough traffic and visibility to be successful. We must all focus on reaching out and following up regardless of how busy we are. 1) Follow all the people who interest you named in the posts I linked in the FollowFriday Lists Link Roundup post. 2) I have a list of the people on those lists who have ~10,000+ followers or more. I can email it to anyone who wants it. 3) Always follow and interact with the people in your niche who retweet others as they are more likely to retweet you too! 4) Pay attention to #followfriday and similar recommendations from influencers. We usually recommend those who share generously and/or have excellent content. They are the people you want to know. 5) Instead of focusing on those who are famous and have tons of followers but follow few, focus on influencers who are supportive of each other and of new bloggers, quality content and good causes. I believe there will be a great divide between those who are sincerely generous like @Ileane @Kikolani @DragonBlogger @NewBizBlogger @DonnaFontenot @SeoSmarty @SearchGuru @Creative_Ace @sweetsfoods and those who aren’t. If you were to put influencers in a Twitterlist you would quickly see who they collectively follow – then follow those people. Identifying is only the first step – the second is to interact with those people. Not all will respond and some you may not hit it off with but real relationships will grow between those who “get it”. It is MUCH faster to connect with those who show by their actions that they are collaborators than it is to try to turn others into influencers! Would you like to be an influencer but aren’t sure how? Read Kikolani’s 8 Best Practices for Collaborative Blog Groups. In our business collaboration is everything. It leads to joint ventures, referrals and a regular source of new ideas. thanks for sharing collaborating is actually very inspiring word. It show a community power. We all need to work in collaboration with each other so that we can benefit each other. I completely agree that instead of focusing on the famous people it is important to focus on influencers, more important to interact with the people in our niche who are going to benefit and enrich us more. Collaborating and Influencing others is what a good competition is all about. Collaborating is certainly the word not just for 2011 but ever since blogging and social networking sites had started. If you want to stay in this business you should learn to collaborate with your fellow bloggers and practice the give and take relationship. No one can stand alone in the blogging business without the help of other bloggers. Quality traffic and enough visibility are the things that you can benefit from collaborating. That’s a great choice! 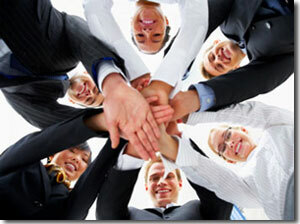 In moving forward in such business or goal, COLLABORATING is the key point. You have given us the great idea and helpful tips in this regard. Great comments with good content should be published. I love it, Gail. COLLABORATING is a great choice for this year’s word of the year. Too many people try to go it alone or promote others only for what they can get out of it. It’d be refreshing to see many more collaborators online (for that matter, offline too). I know about half of the people you listed in your post, but if the other half are like them I can’t wait to get to know them. Welcome to GrowMap Brad and thank you for taking the time to comment. The others you don’t know ARE just like the ones you do! The more of us we can find and support the more good we can do. Yes yes. TEAM = Together Everyone Achieves More! Well we are already seeing how strong a good collaboration can be. Looking at these blogs like Growmap, Basic blog tips etc. etc. I love your post Gail and your mindset is totally on target. Reaching out and helping others is one of my biggest goals and joys of being online. I believe we all have something to learn from each other and can find ways to make a difference in each others lives. Collaborating is the word for this year! Great post!!! Yes those exclamations are intentional and well deserved too. Many of those you mention I do follow and totally agree with your statement, “I believe there will be a great divide between those who are sincerely generous like…and those who aren’t.” My blogging/writing skills need mega work compared to yours otherwise I just might have said this first ’cause I sure was thinking/feeling it! Supporting is #1 in my opinion. BTW – Found you via sweetsfoods best of the week post! I like your word for this year- collaborating. This is very important especially in social networking sites like twitter. I agree that we should follow and interact to our followers. Thanks a lot for the tips! Gail, It’s always a pleasure to visit your blog. You’re so welcoming and you have such a positive attitude. I look forward to working with you – any of the other bloggers you mentioned in the post, and anyone else who feels the same way about collaborations. I love what you said to Gera from SweetsFoods, he really get’s it. I noticed that about him and I was really pleased when he agreed to do an interview on my blog. As a result of the interview, Gera and I have been able to gain even more respect and friendship for each other. It’s these types of collaborations that we need to encourage, and I really appreciate how this post can serve as a catalyst and a call to action. What an awesome post. One of the main things I wanted to focus on in 2011 was to collaborate and grow my network, especially in regards to local businesses. I’ve come up with this Local Business Spotlight that we kick off on Sunday on the blog for my small business, as well as my personal blog and soon on Intense Business as well. Well, the internet is becoming more social and “COLLABORATING” plus “CONNECTING” will be one of the most important ways that people will and should follow to stay on top. We can all look at twitter and facebook, and understand that the web is becoming more interactive and people start collaborating more on the web. Going with the flow and find a group your pertain is a good way to start connecting, followfriday is one of the coolest and best way to find great people you should interact with and of course learn from. Keep connecting! It’s the future! I’ll agree with you on this making the word “Collaborating” the word for 2011. You are right in saying that collaborating is very important because as I understood it, it matters a lot in the success of the businesses and for the bloggers who are doing so. In this early time of the year, let us spread that “Collaborating” is the word for 2011 and how it works to make your business a successful one. Collaboration, both internally and externally, has proven to be successful in increasing business production and expanding relationships with clients. This post comes as no surprise, but it’s good to see that collaboration is the new word for this year! Two or more heads are definitely better than one. Collaboration will definitely make a work better. There are some things that one blogger does greater than the other and those two works collaborate, a fabulous work will be done. Just become part of one tribe, also a biz support group and helping as many newbies as come across my path who I can. No use them asking me any techie stuff as I go to the geeks for that myself! But how to network, social media or writing/proof reading their articles, I will be there. So many have given to me, I love when I can give something back. I totally agree that working in isolation will make it hard to succeed. Working with others will cheer us on to greater things. Sweet. Thank you for this wonderful comment, Patricia. You are one of the bloggers who understands how to reach out and offer assistance to those who are very unlikely to ask for it themselves. You will be one of the leaders in identifying and putting together the most influential blogs in your niche. I just stopped over from Michele’s post. I like the word of the year. Collaboration is something that I am going to work on this year. Your post here and Michele’s post really hit home with me. You both have made me realize that this is something that I am missing in helping me grow my business. But even more than that, I also affords me the opportunity to help others grow their business as well. I think that’s a fantastic word! Let’s spread the word…lol. Mark above said “Collaborating and networking have always worked in the real world, why not the web?”- so true. I think people get online and maybe because they are behind a computer screen and/or dealing with different technicalities, that the rules are different. Many of the foundational “real” world tactics and theories can and should be applied to online businesses. Networking has been a tried and true technique and applying those some philosophies and elements online will be to your benefit. Great tips… I really like #4 (pay attention to #FF). I have to admit, I don’t always check them out, but after reading your reasoning behind it on why it’s a good idea, I will definitely be taking that on! OK, enough of my short comment 😉 – thanks so much for the mention. You are truly awesome! Collaboration is key also in offline tasks, like designing teams or software developer where you use ideas or tips from others. Online is the same, more in social networking to boost posts, topics or what ever you want. Twitter is a good example where you can add your sand grain to help other bloggers! Totally agree #5 – persons are their concrete actions. I much appreciate your @mention Gail! You are one of the few who is included in lists like these because of your generosity in reviewing quality content on StumbleUpon and sharing it on Twitter. Even when more people start figuring it out you’ll still be on my short list. Hello Gail, I just published a post on how the word “Influence” has been abused during 2010 without real positive value as outcome. I like your word for 2011 and I hope we can look back at the end of the year and see that we were really able to collaborate with other people in projects that have positive outcomes in mind. Thanks for your post and have a Happy New Year! In any areas of work, collaborating is very important. In social networking sites, it is nice to engage in discussions and share good content. It’s one way also to know and learn from the ideas of others. I like your no.5 tip. I only have few followers in Twitter but I always take time to interact with them. Thanks a lot for the tips! I am going to have to agree with you. Blog commenting for SEO purposes does not feel “right.” Collaborating and networking have always worked in the real world, why not the web? I don’t mind using KeywordLuv and CommentLuv to attract those whose original intent was blog commenting for links who read my content. They often become regular readers and commentators. Small businesses need an easy way to build incoming links and make it obvious what they do and these two plugins make that possible without them writing overly promotional comments. Remember that when link building what is linked is the search you are targeting. If you link “website ranking, internet marketing, Raleigh Durhm advertising” you can easily rank for that but no one is ever going to search for that. It is best to use ONE 2-3 word phrase per link. See the post I’ll share in CommentLuv.